“Now What Do I Say?”: Practical Workplace Advice for Younger Women gives women earlier in their careers practical advice about difficult verbal exchanges at work. 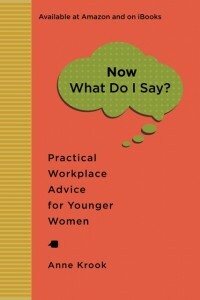 Many younger women report routine workplace interactions that, intentionally or unintentionally, question their authority, their competence, and their intelligence.This book provides a range of responses that might be useful in the moment, and gives some guidance about when and how to use them and what to do when the responses fail to help. It provides guidance for thinking through, in advance, how to react in support of their longer-term interests in the workplace, including what might help prevent these situations from arising in the first place. Available from Amazon in paperback or as an ebook and on iBooks as an iBook. This entry was posted in Uncategorized on April 14, 2014 by akrook.